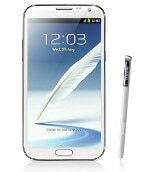 The Samsung Galaxy Note II was announced by Samsung in August 2012. The oversize Android 4.1 ‘Jelly Bean’ handset features a 5.5-inch screen with S-Pen functionality, 1.6GHz quad-core processor, and NFC. The device started shipping in October 2012, quickly notching up 5m sales.